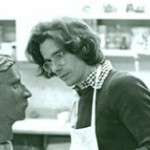 Professor of Art – Sculpture, also taught drawing. Served as East Wing Gallery Director and Chair of Art Department. My years of teaching in the Art Department, in a close collaboration with my fellow teachers, was a most memorable aspect. I was pleased to have set up and developed a bronze casting facility for the sculpture department. The level of the students who went through the art program and beyond made it the rich experience it was.